Even though, from a metaphysical point of view, (love and any other) relationships are not the ultimate goal in life, nor are they the ultimate purpose of life, the subject keeps many of us busy obsessively. Because compatibility is the key to all successful relationships, we at Cosmic Technologies (CosmiTec) are proud to present you awesome astrological compatibility hints and tips that might (and will) enhance your (love) life and bring about a deeper understanding and consciousness on how relationships work. ... you may be(come) highly disappointed (sooner or later). 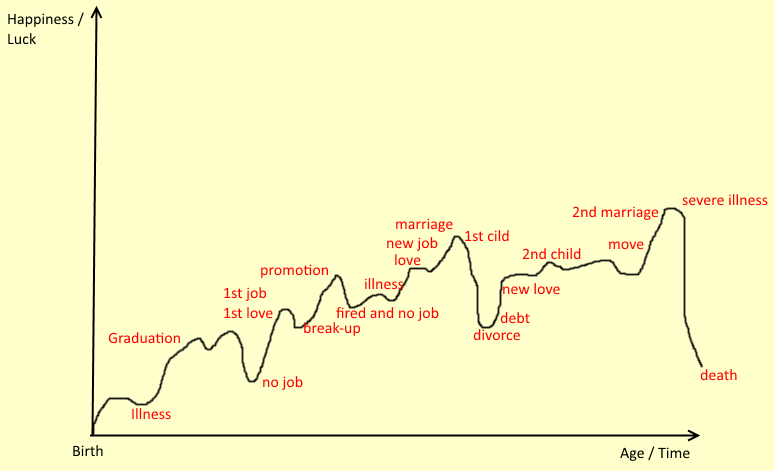 Numerous (relationship) issues exist and grow because no one seems to see life unfolding according to this 2nd graph. 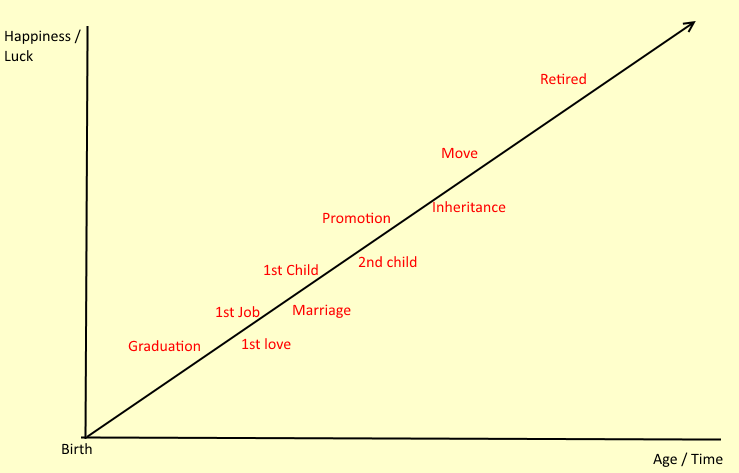 People tend to obsessively stick with static and linear thinking shown in the 1st graph above, while in reality their (love) life unfolds according to the 2nd graph. Of course, this discrepancy makes for quite some turmoil, agony and love's sorrow. That's why we, at Cosmic Technologies, want you to know how things really work on this very planet, from an astrological point of view. From a metaphysical point of view, relationships (in the widest sense) are just means or tools to develop your own Self and to let you experience everything possible (or impossible), so to bring your own Self closer and closer to perfection over time (life after life). Because relationships want you to learn a lesson or help you to experience something, they will also impose some challenges. Without challenges there are no lessons to be learned and there can be no development, growth or evolution! In our astrological compatibility advice (reports) we will often point to this very important Universal Law. We at Cosmic Technologies (CosmiTec) continuously do empirical and statistical research regarding astrological compatibility and all life stages (marriages, births, etc.) to help you understand how these experiences and events can help you in your development. We can show you what's in your lifemap (natal chart), which reflects your pre-birth agreement (soul contract). We try to deliver methods and a workflow that will give you insight in all your relationships, so to enhance your relationship experiences and raise your awareness and consciousness. Beware though that we have a very realistic approach that may differ from your preconditioned mindset. Your mindset can be full of linear assumptions and unrealistic expectations as mentioned above. On this web site (and in our free monthly Newsletter) you will find the results of our (ever continuing) research. Also, many relationship or compatibility questions and issues will be discussed in our articles that are most often based upon our astrological research. Our aim is to provide astrological compatibility advice that is still comprehensible, but with a high technical standard. We hope to be as reliable as possible. Hence, we use knowledge of most major astrological schools in the world (so, this is one of our assets) and we will present what really works. It also makes sense to us that human compatibility problems are analyzed, delineated and solved by human interactions and inter-personal connections. When you do have a personal question that you would like to be answered, when you have to deal with your feelings of love or grief, ... do you really expect an answer from a machine or a computer? Honestly, we DO NOT (except when we just want to have FUN). That's why all questions you pose to Cosmic Technologies (CosmiTec) will be answered by a real astrologer. We are committed with your situation and hope that some advice on astrological compatibility can be of any help. And with the flow of time, month after month and year after year, we will present more and more mind-blowing astrological compatibility secrets and tips. Get Horoscope Profiles From Cosmic Technologies (CosmiTec). Our Reports and Profiles are NO Automated or Computerized Reports. They are delineated by a real human astrologer. See the difference! Astrodamus astrological reports provide the most innovative and accurate reading if your time of birth is accurate. Why don't you convince yourself? There is a free report too. Read the unsollicited testimonials that Cosmic Technologies (CosmiTec) receives from visitors and customers. Follow our site map and explore our web site! Compatibility horoscopes analyze the relationship you both have with one another. Strategies, hints and tips on astrology seduction and finding out how to seduce any zodiac sign by the stars. Love and astrology are the perfect match to uncover your own love potential and what love means to you. Your marriage is cut in stone with the marriage horoscopes. We tell you why. When is Love over? Our divorce horoscopes will tell what astrological indications point to divorce. Read here how astrology can help in dating the right person at the right moment. Our personalized free love forecasts will show you when your time has come to meet the big love you're longing for, or when your existing love life will blossom (again). Don't let these moments pass! What can be told about the zodiac signs in love? Read this and know their quirks before committing yourself too much to someone. Not using midpoints in astrology is like driving a car without wheels! Analyzing celebrity horoscopes is a wonderful way to learn and better understand astrological compatibility rules. Our examples will show you. Love quotes can define the essence of planetary combinations and aspects. Read here the love quotes for your Sun sign! In matters of the heart, the gifts you give - how small they are -, always tell more than 1,000 words. Especially the most unique gifts! Our astrology book reviews delve into the world of empirical astrological research. Only the best and most reliable astrological must-haves are featured here; books you wil refer to over and again.